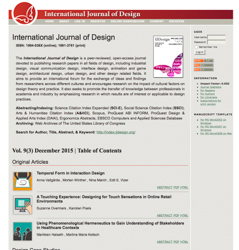 The focus of the journal is interdisciplinary, aiming to make connections between disciplines or approaches. It is aimed at a wide-ranging readership that would include not only academics but also performers, practitioners, and artists from a whole range of disciplines. 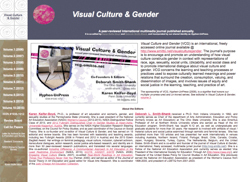 Visual Culture and Gender (VCG) is an international, freely accessed online journal. 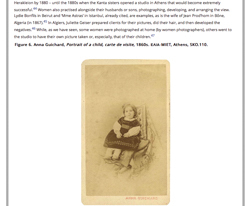 The journal’s purpose is to encourage and promote an understanding of how visual culture constructs gender in context with representations of race, age, sexuality, social units, (dis)ability, and social class and to promote international dialogue about visual culture and gender. 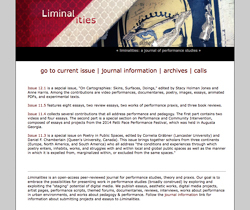 Liminalities is an open-access peer-reviewed journal for performance studies, theory and praxis. 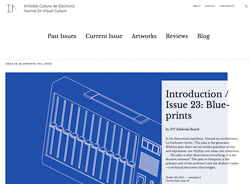 InVisible Culture: An Electronic Journal for Visual Culture (IVC) is a student run interdisciplinary journal published online twice a year in an open access format. Through peer reviewed articles, creative works, and reviews of books, films, and exhibitions, issues explore changing themes in visual culture. Fostering a global and current dialog across fields, IVC investigates the power and limits of vision. 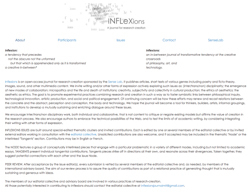 Inflexions is an open-access journal for research-creation sponsored by the Sense Lab. It publishes articles, short texts of various genres including poetry and ficto-theory, images, sound, and other multimedia content. The goal is to promote experimental practices combining research and creation in such a way as to foster symbiotic links between philosophical inquiry, technological innovation, artistic production, and social and political engagement. 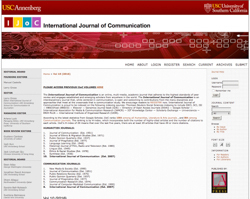 The International Journal of Communication is an interdisciplinary journal that, while centered in communication, is open and welcoming to contributions from the many disciplines and approaches that meet at the crossroads that is communication study. 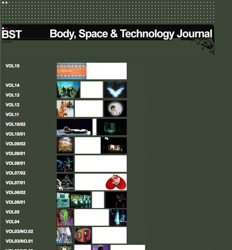 Published by The MIT Press and led by executive editor Roger Malina, Leonardo has become the leading international peer-reviewed journal on the use of contemporary science and technology in the arts and music and, increasingly, the application and influence of the arts and humanities on science and technology. 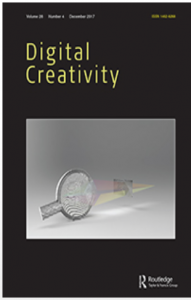 Digital Creativity is a major peer-reviewed journal at the intersection of the creative arts, design and digital technologies. It publishes articles of interest to those involved in the practical task and theoretical aspects of making or using digital media in creative disciplines. These include but are not limited to visual arts, interaction design, physical computing and making, computational materials, textile and fashion design, filmmaking and animation, game design, music, dance, drama, architecture and urban design. Photography & Culture is a refereed journal that is international in its scope and interdisciplinary in its contributions. It aims to interrogate the contextual and historic breadth of photographic practice from a range of informed perspectives and to encourage new insights into the media through original and incisive writing. 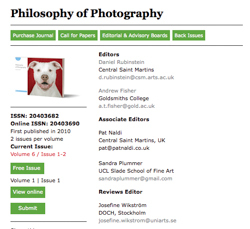 The journal’s aim is to provide a forum for theoretical and critical debate of issues arising from the historical, political, cultural, scientific and critical matrix of ideas, practices and techniques that constitute photography as a multifaceted and changing form. 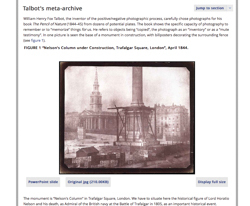 In a contemporary context characterised by its diversity and rapid rate of transformation, the conjunction of ‘philosophy’ and ‘photography’ in the journal’s title is intended to provoke reflection on the ways in which existing and emergent discourses might engage with each other to inform our understanding of the photographic. 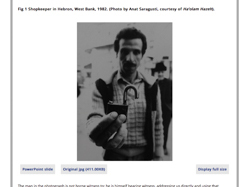 History of Photography is an international quarterly journal devoted to the history, practice and theory of photography. It intends to address all aspects of the medium, treating the processes, circulation, functions, and reception of photography in all forms, including documentary, vernacular, popular and polemical work as well as fine art photography. The goal of the journal is to be inclusive and interdisciplinary in nature, welcoming all scholarly approaches, whether archival, historical, art historical, anthropological, sociological or theoretical. 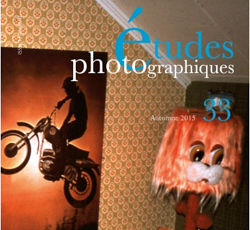 It embraces global photographical history, ranging across all geographical and cultural contexts around the world. Since 1996, the peer-reviewed journal Études photographiques, published by the Société française de photographie, has been the French-language publication of record addressing the history of photography and visual culture, and provides access to the most current research on visual objects. 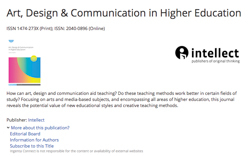 How can art, design and communication aid teaching? Do these teaching methods work better in certain fields of study? 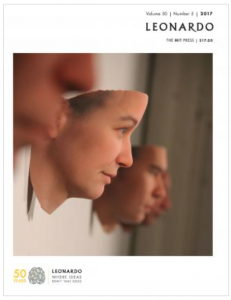 Focusing on arts and media-based subjects, and encompassing all areas of higher education, this double-blind peer-reviewed journal reveals the potential value of new educational styles and creative teaching methods. 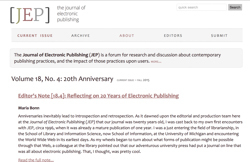 The Journal of Electronic Publishing (JEP) is an open access journal that publishes research and discussion about contemporary publishing practices, and the impact of those practices upon users. 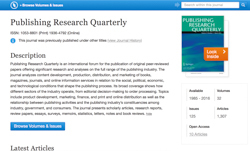 Publishing Research Quarterly is an international forum for the publication of original peer-reviewed papers offering significant research and analyses on the full range of the publishing industry. The journal analyzes content development, production, distribution, and marketing of books, magazines, journals, and online information services in relation to the social, political, economic, and technological conditions that shape the publishing process. 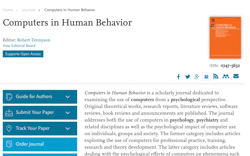 Computers & Education aims to increase knowledge and understanding of ways in which digital technology can enhance education, through the publication of high quality research, which extends theory and practice. The Editors welcome research papers on the pedagogical uses of digital technology, where the focus is broad enough to be of interest to a wider education community. 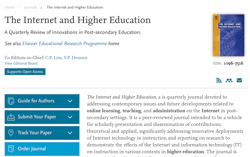 The Internet and Higher Education, a is quarterly journal devoted to addressing contemporary issues and future developments related to online learning, teaching, and administration on the Internet in post-secondary settings. It is a peer-reviewed journal intended to be a vehicle for scholarly presentation and dissemination of contributions, theoretical and applied, significantly addressing innovative deployments of Internet technology in instruction and reporting on research to demonstrate the effects of the Internet and information technology (IT) on instruction in various contexts in higher education. Information & Management serves researchers in the information systems field and managers, professionals, administrators and senior executives of organizations which design, implement and manage Information Systems Applications.